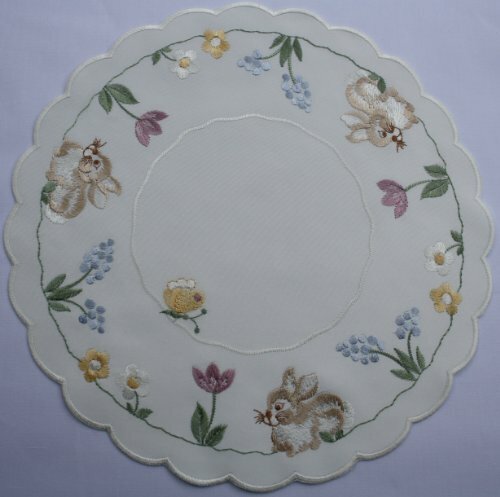 Easter Linen Doily with Tan Bunny spring blooms and butterflies. Cream colored background with slightly scalloped edge. Beautiful table accent. Will bring a spring feeling to any room. Easter accent piece. Imported from Germany, with beautifully detailed machine embroidery. Thread has a slight glossy appearance, High quality front and back. Machine washable with little or no ironing. Will not pucker, discolor or fade. If you have any questions about this product by Yesteryear Linen, contact us by completing and submitting the form below. If you are looking for a specif part number, please include it with your message. Christmas Doilies . Star Shaped Cream Colored Doily with Christmas Trees and Snow, Gold Thread Accent. Diva At Home White and Glossy Black Tabletop Morgan Small Decorative Horn with Base 9.5"
Diva At Home Pack of 8 Chocolate Brown Finished Decorative Cat with Santa Hat 6"